The bleachers are full and hundreds more are crammed onto the floor of a middle school gymnasium, looking about anxiously. Some dance with enthusiasm, some sway noncommittally to the music piped from the speakers. It’s currently U2’s “City of Blinding Lights,” which must refer to Ottumwa. The scoreboard is lit, displaying 20:08 remaining, with a score of 20 to 08. Nice touch for the leading zero. There are lights aimed high on the walls and ceiling, with custom-cut gobos projecting his logo and another reading “Obama ’08.” It’s 3 degrees and 10:45 p.m. on a Tuesday and he’s late. No one really seems to mind. The tangible enthusiasm displayed in hand-made signs and embroidered Obama fleece pullovers in combination with the slightest sense that no one really knows how to behave makes the event feel like the strange hybrid of a junior high dance and pep rally. It was vastly different from the Biden rally two days earlier, which was held in the Mississippi River Museum. Coat racks were available at the entry and folding chairs had been set up in the main gallery, and organizers seemed a bit surprised to find that the hundred or so preset chairs were insufficient to seat the whole of the crowd. Posters were distributed by interns, and a young man, I’m assuming another intern, played some improvised jazz on a keyboard. A local figure introduced Richard Schiff (West Wing) who, in turn, introduced Biden. I won’t bore you with the substance of the speeches, it’s just exactly the same as you can read everywhere else, but I am fascinated by the differences from a theatrical point of view. Biden stuck to pacing proscenium-style across the floor in front of the chairs in a kind of fourth-wall soliloquy. His weight was shifted back over his heels and his chin was raised; his bearing was regal, but distant. Even in the period of questions following his speech, he sometimes chose the questioner, but he rarely addressed his response directly to that individual, it may as well have come from a cue card. Obama was introduced by his wife, who was herself introduced by a local figure. They appeared in the round, leaning forward as they spoke and turning to address the audience which surrounded them. (The median age, by the way, was easily half that of the Biden attendees, not to mention being a bit more diverse in terms of demographics.) They tucked their chins and maintained eye contact in direct audience address, sometimes even referencing an individual in real time, a device designed to engender a sense of connectedness. My observations are not intended to be critical of either candidate, I only find it to be a fascinating phenomenon. In a race where many of the candidates are virtually indistinguishable on paper, I suspect that it this dynamic which is likely to decide the election. Fast-forward to The Big Day, and my mother is currently fashioning herself a red, white, and blue sash to display her Obama button collection while she helps to set up for the caucus. I’m trying to stay out of the way because my sister is, even at this late hour, undecided and things are getting ugly. She may be holding out for baked goods and other (completely legal) incentives suggested in the How to Caucus class they attended over the summer. The half-sign for Clinton reflects the survival of the fittest conditions here. The couple who live across the way are divided in their support. 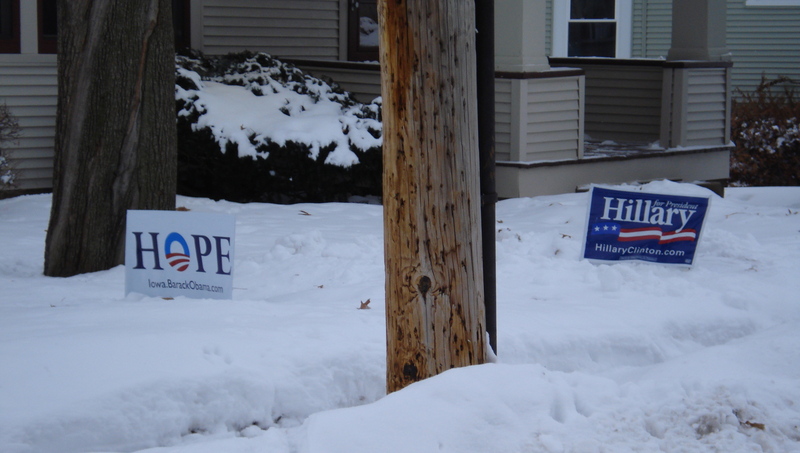 Two yard signs competed for attention until the recent snowfall- Hillary’s sign was mysteriously half-buried by the snow shoveled from the walk, where Obama’s sign was unobstructed. Later, I tried to get a picture of this dirty yard campaigning, only to find that the polling results can now be modified to include a WHOLE sign for Hillary. Sometime in the night, the half-buried sign was unearthed, and a wide, level surface was created in the snowbank to ensure the sign’s entire message is visible. I think it shows remarkable self-restraint on the part of the shoveler that she didn’t bury Obama’s sign in turn… probably more self-restraint than demonstrated by the candidate in question. The barely receding snow revealed that Edwards, too, has a lone sign in the designated polling region. His visible supporters were also more apparent when I drove downtown to go to the post office, where, well, you know, the lower middle middle class people live…. The local firefighters union is supporting Dodd, which is why, I believe, he has more visibility in my poll than he does in the lesser ones being touted by CNN. I have seen very few signs of Republican support, literally or figuratively. I can only speculate that Dubuque is probably among the most liberal cities in Iowa, so I imagine that they don’t wish to waste a whole lot of time and money here. My mom and sister went to see Giuliani, but that was over the summer. They were, in a foolish rookie intern mistake, ushered up to the front of the seating (they claim that it’s only because a black couple declined) but did not perform as expected: no poster waving or standing ovations. Over and over again some intern mistakes my sister’s blue eyes and blonde hair for wholesome doe-eyed naivete and a good photo opportunity. So they ALWAYS let her ask a question… and often regret it. Both really wanted to hear Romney, but were disappointed to find that the only access was either closed or a $1000 plate dinner. Finally, today, I braved three-degree weather to bring Fat Clown’s readers up-to-the-minute New Year’s polling info. As we approach Thursday’s caucus, we see two new signs for Edwards and one new sign for Obama, but the new year seems to have infused new fervor into the Biden campaign, with the addition of FIVE new campaign signs, like ducks in a row, so he is no longer outnumbered by generic No War signs. You really start to get the feeling that the candidates would write their names in yellow snow if they thought you could see it from the street. This would be a disadvantage for Hillary, to be certain, but I’m sure she’d manage somehow. So there you have it…if the caucus were held today, the next President of the United States would be Barack Obama. Of course, what makes this really different from any other state right now is not just the passive yard signs, but the amount of incoming active messages. 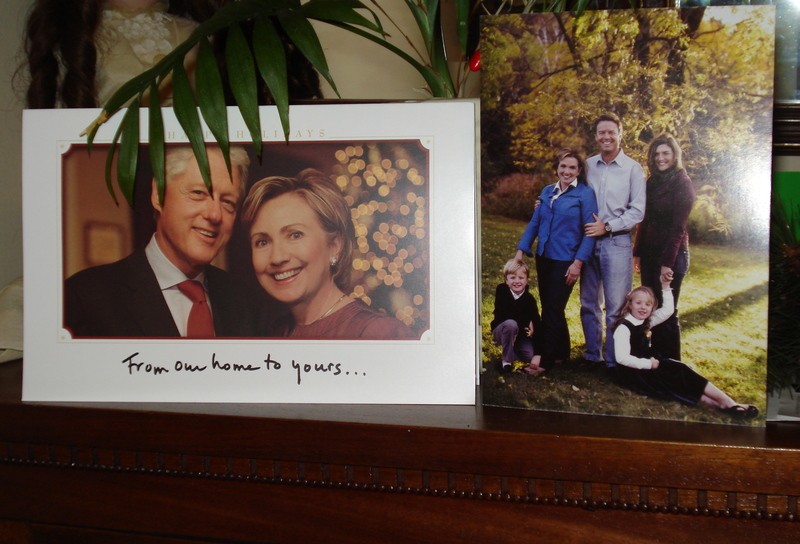 Yesterday’s mail brought exactly 12 pieces of caucus-specific campaign mail, 10 from Hillary and 2 from Obama. The phone rings, at minimum, ten times daily, alternately asking for my mom’s support or her vote at that instant in time. Now, I know that correlation does not prove causality, but you can’t help but wonder at this coincidence: there were four new For Sale signs and one advertising (or warning of) the addition of an Invisible Fence when I went out to look today.